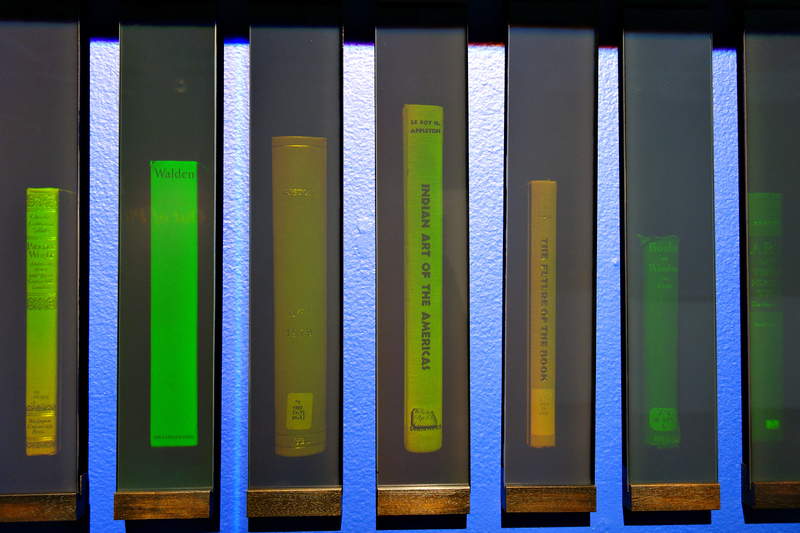 Wenyon & Gamble’s “Bibliomancy” is a hologram library of ghostly books that conjures the past while considering the future of the printed word. 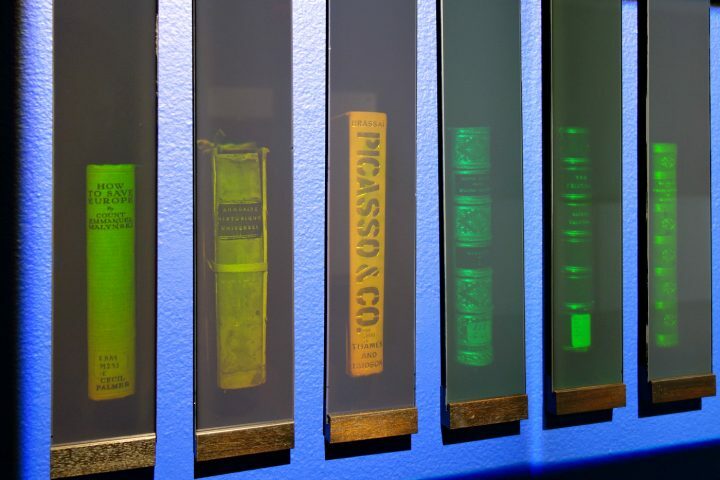 A shelf of 54 books glows in Magnan Metz Gallery, their weathered spines illuminating titles like Wonders of the Invisible World and The Absolute Weapon. On approaching this otherworldly library to examine a volume closer, it’s revealed that the books are all holograms, their covers receding into darkness. Wenyon & Gamble: Out of Place, now on view at the Chelsea gallery, is the first New York showing of “Bibliomancy.” The installation by Wenyon & Gamble (the duo of Susan Gamble and Michael Wenyon) debuted in 1998 at the Boston Athenaeum, with the books sourced from that institution’s collections. Although it’s now almost 20 years old, titles such as Europe, Going, Going, Gone! and The Strange Career of Jim Crow are reminders of how history always haunts the present. 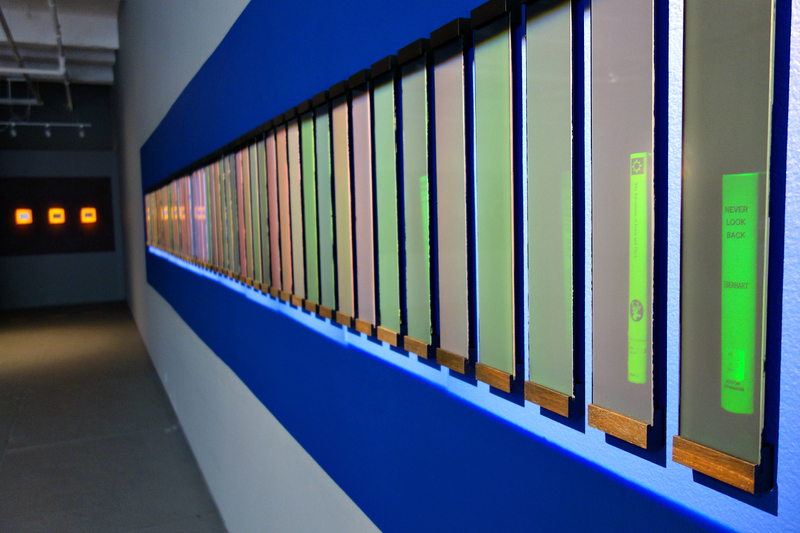 For this iteration, the walls painted a contrasting blue as they were in 1998, the artists have surrounded “Bibliomancy” with other uncanny specters of the past. Card catalogue drawers with their found poetry categories — “League of Nations to Leather Jacket,” “Dolly to Domestic Dilemmas” — hover in sepia-tinged holograms, while chunks of coal glisten in others. 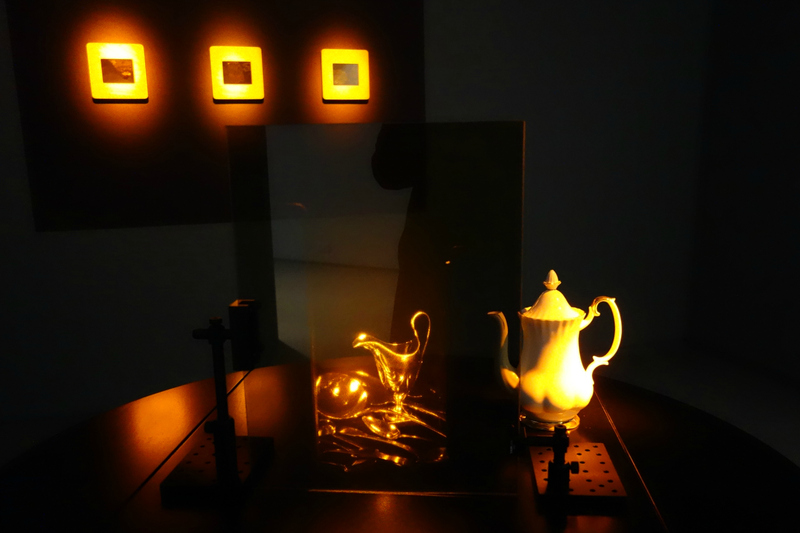 In the second room, a teapot is confronted with an eerie phantom of antique silverware, projected in elusive three dimensions. Wenyon & Gamble regularly use holography to ruminate on outdated technology. Their 2012 exhibition at Magnan Metz — A Universe held up for Inspection (reviewed in Hyperallergic by Ellen Pearlman) — explored the legacy of the analogue photograph. For instance, holograms of wooden glass plate storage boxes. It’s interesting that Wenyon & Gamble continue to emphasize that holography, in a way, has more in common with 19th-century photography than that of the 21st century. 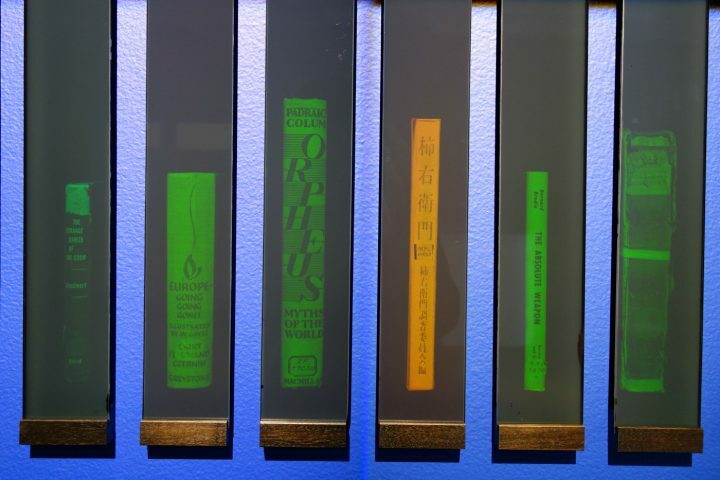 Daguerreotypes in Out of Place have a similar hands-on process to the holograms, which are animated with 3D images captured through lasers and emulsion on glass. Norman Bryson in his 1998 catalogue essay for “Bibliomancy” writes that there “is something about holography that is essentially untimely; it was born too late, or too soon; in a sense its time has never come.” Holography emerged in the 1960s as an artistic platform, yet it’s mostly been regarded as kitsch, more likely to be seen as a science museum novelty than in fine art institutions. That lack of a certain time also gives holography a strength. The titles of the “Bibliomancy” tomes are often references to a lost past, whether Pursuing the Whale or the incredibly slim San Francisco Social Register. The word “bibliomancy,” meanwhile, refers to a divination practice of opening a book to a page and conjuring meaning from a passage. Together, these elements invite the viewer to find their own resonance in these disparate volumes, and consider what a book means as a physical object in our increasingly digital future. Wenyon & Gamble: Out of Place continues at Magnan Metz Gallery (521 West 26th Street, Chelsea, Manhattan) through December 17.